Verisk Analytics business ISO, a leading source of information about property/casualty insurance risk, released the National Building Code Assessment Report on the status of the nation’s building codes, including individual assessments of each participating state. The report provides a comprehensive examination of building codes and their enforcement in 20,800 communities representing 87 percent of the U.S. population, and this year includes a section on the International Code Council. As part of the Building Code Effectiveness Grading Schedule (BCEGS), which ISO created to assess the building codes in effect and grade communities on both code adoption and enforcement, the ISO Community Hazard Mitigation staff collects thousands of data points that detail the extent and capabilities of a graded community’s building code adoption and enforcement. The information gathered falls into three major categories: administration, which includes the adoption and enforcement of the latest model code and staff training; plan review, such as internal processes to promote accuracy; and field inspections, including the local building department’s staffing level, workload, and inspection of structural features related to natural disaster mitigation. 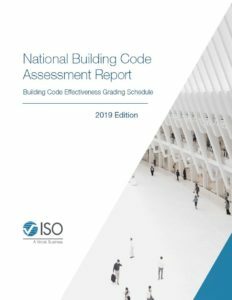 ISO grades the building code effectiveness in communities in 45 participating states, assigning each municipality or county a BCEGS grade of 1 (exemplary commitment to building code enforcement) to 10. The National Building Code Assessment Report provides the average grade for each state, the average population served per certified code official, the top natural hazards, and the state’s history in adopting the latest model building code, among other factors.